Editor’s Note: We published an update of our bookstores in March of 2014. 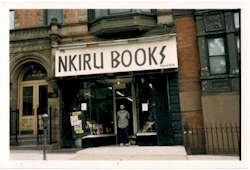 One of the very first things I put on AALBC.com’s web site, back in 1999, was a list of independent, Black owned, bookstores. This list was very difficult to maintain and over the years various individuals contributed to help keep it up to date. My list, unfortunately, had not been updated since 2007. In a joint effort, that included ABLE (The Alliance for Black Literature and Entertainment), Huria.org and AALBC.com, the out of date list of independent, Black owned, bookstores was revived and updated into database driven directory with maps, social media, photos and more. The new bookstore database was launched today today and is available at Huria.org and here on AALBC.com (https://aalbc.com/bookstores/). …Actually I do have something to add. If you happen to reside in a community fortunate enough to have an independent bookstore, please support it. These establishments are true community and cultural, treasures. Sure eBooks and websites are great, but not everything can be replaced with machines and technology. While we attempted to make this list as accurate as possible, mistakes do occur. If there is a store posted here that is indeed open please lets of know so that we may remove it from this list and add it to our database of bookstores. You may post the correction in the comments below or email me at troy@aalbc.com. Our database of bookstores can be made available to anyone interested in posting it on their website, with a single line of code. Email me at troy@aalbc.com if you are interested.